In 2015, LEGO released a range of sets for Jurassic World which quickly became fan favorites due to their variety and creativity. While the builds weren’t very accurate to the film itself, they were fun, and captured the Jurassic play factor and identity fairly well. Due to their roaring success, fans have been eagerly looking forward to how LEGO would step up the game with their Fallen Kingdom range – it was widely assumed the new range would be more involved, and accurate to what was on screen in the movie. LEGO toys are always fun, and these are no different, but after the success of Jurassic World, plus the solid sales of the merchandise, we were left hoping for more. LEGO usually does a great job with licensed properties (look no further than Star Wars or Harry Potter), so by comparison, these look particularly simplistic. It would be easier to be less judgmental if LEGO prices were not so steep, but considering their profit margin, it’s hard not to want a little more. Perhaps there is yet another set yet to be discovered, exclusive to a specific retailer, which will help further flesh out the line with new content. With any luck, LEGO will continue to support the Jurassic brand after these sets, and not wait for the next film, offering more variety in time. Again, thanks to [redacted] for first reporting on these LEGO sets. The sets are expected to release some time after April 16th, 2018. Sound off in the comments below to let us know what set you’re looking forward to the most, and stay tuned for all the latest news! Jeepers, didn’t realize that your potential spoilers would be coming from the author and not the content of the leak itself! Great article and descriptions, guys! I appreciate that you avoided describing the Indoraptor design. I’m personally really excited for these sets, I am a huge LEGO fan and I will be buying the entire ”normal” wave. It sounds like I have to buy the biggest Juniors set just for the Rex though I despise Juniors. I know you can’t share pictures, but can you post a sketch or small piece of the image that shows the Carnotaurus? If you can’t post a sketch or screenshot of just the Carnotaurus, can you explain why it’s more cartoony than the other dinosaurs more specifically, and why it’s generic? Although it’s not as cool as hoped, it doesn’t look *that* bad. Just wish the coloring was more accurate. Great art, and thank you! Also, someone on reddit asked for a sketch of the Indoraptor. Sorry for the troubles. Could we get some sketches of the Indoraptor and the Stygimoloch? It looks good, but shouldn’t really be as large as Rexy and the Indominus. Even if they had to re-use the I.rex body I find it hard to believe that scaling it down to be slightly smaller wasn’t an option to them. Who wants a bet that the Triceratops skull will play a role in the final battle? That Carnotaurus sounds disappointing. Is the Head mould re-using the rex jaw? Stygimoloch Research Set = Weaponized Dinos maybe !?? Are you saying there is going to be a stygimoloch lego set I’m sorry I did not get to see the photos. This is what I was afraid of…. Overpriced and underwhelming Lego sets. I love legos. I love Jurassic. So when I heard JWFK would have Lego sets, I was pumped! But now… I am very disappointed. Cartoony Carnotaurs? Oh so many Owens? IGNORE IAN MALCOM??? I’m out of Alliterations. Ian Malcolm will probably be another “you will get this figure for free but first give us 55$” promotional figure. Or it could be the preorder bonus for the rumored LEGO JW2 game. And are you seriously telling me that I have to buy a flipping Lego Juniors set JUST to get Rexy?? Did I miss something? Because NOWHERE does it mention a T. rex in the regular sets. I dont like it either. I despise Juniors but I have to buy that set if I want Rexy. They could have easily put her in the place of one of the Blue’s in the set. Currently getting new in box rex costs $110 from resellers, adding it to a Juniors set makes it attainable without having to take place of alternative dino in normal set. Its a great move by Lego. juniors aren’t THAT bad. it’s not like you have to get duplo. legit bricks and minifugures! plus, did someone mention blue? indoraptor? lockwood? SHOWDOWN? If you don’t usually follow Lego leaks/rumors it should be noted a lot early leaked images include placeholder minifigs (and possibly dinosaurs in this case). That being said the 2015 Jurassic World sets were a pretty big letdown so not expecting much more this time around. Also, a question for Chris and Jack: Why do you keep calling the young girl “Maisie”? I thought she was named Lucy. Did something change? Or is this a different character? Lucy was just the name for the casting call. 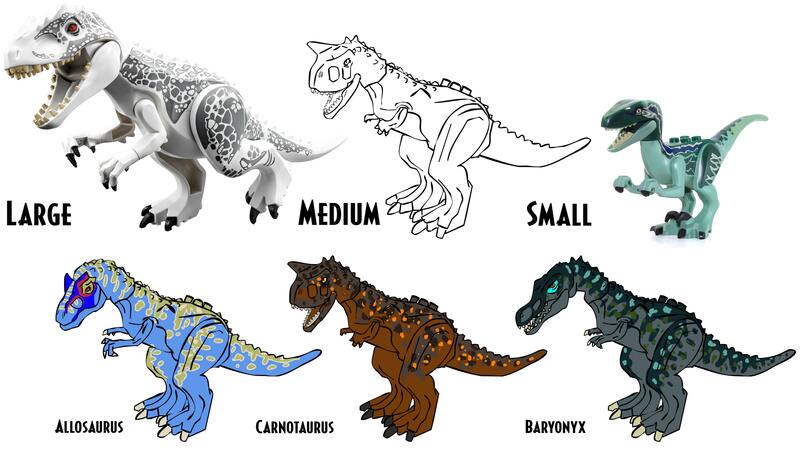 I’m am looking forward to the Carnotaurus Lego set. Looking good so far! Cant wait! Ok.. but why is there no Baryonyx Set?! About all the Hype?! Rather using a frickin Sticky… But i liked him in the Warpath Game. So they dropped the white/blue color scheme from the previous sets? Would the green generic raptor in Juniors set 10757, be the same from 5884: Raptor Chase? Vet in Indominus Breakout saw action before in the Rex Tracker. I believe Vet will play a pivitol role in the next film, perhaps a spin off tv series on TNT. I checked my sets and the 2 Vets have different face prints. They’re similar, but not the same. Point still stands in its entirety. Either way Owen being in so many sets would still seem off considering they’d either had only 1 or 0 repeat characters in the last line up. I hope there is going to be a wave two released after the movie of scenes that are featured after the 57 minutes of the trailer. i think i know who the mystery raptor is! *drumroll*…Charlie! she was picked up by the front of the I-rex’s jaw, so not full bite force, then thrown. blue survived being swiped into a stone pillar WHICH CRACKED, so it’s entirely plausible that she survived. plus, the others, echo and delta, were blown up and set on fire, much more clearly dead.. charlie is green, like the lego. plus, in order to survive, maybe blue and charlie mated like those frogs mentioned in jurassic park, which is why we see the baby raptor, who as the offspring of blue could have similar markings. admittedly, ingen probably wouldn’t make that mistake again, but life finds a way. Looks good Chris! I wouldn’t call it crude at all. Someone send this to LEGO! They need to see this! The baryonyx arms are to small but otherwise it looks great. Lovely concept. The more I think about it, the most likely explanation is that they botched this possibility up simply out of being cheap. Rather ironic knowing that previously it was Hasbro cutting costs while Lego was the only company giving us anything worth investing in. Go figure. how did you upload an image ? If this is turns to be a real thing, My wallet is going to be emptier than it already is. These are really good. I get a Spinosaurus feel from the Baryonyx which is cool! The Allosaurus looks simply amazing, and the Carnataurus looks spectacular. Amazing work! Having trouble believing this. Sounds absolutely terrible. Very un-Lego like indeed. where did you get them vladimir? Post them in the comments so I can screenshot them. Plz dude! I hope I don’t bother anyone but I was hoping if someone would be kind enough to shed some light on my predicament. I wanted to know if their are going to be new dinosaurs the carnatosaurus and stygimoloch in any of the new lego and/or juniors sets ? If anyone would be so kind as to respond I will gratefully thank them.